Headed to a July 4th party or Saturday evening cookout? 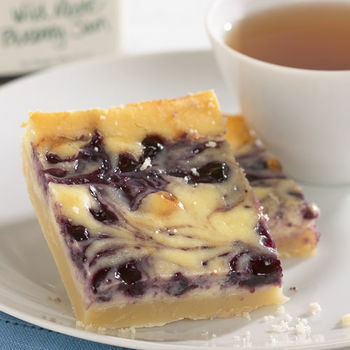 These Blueberry Cheesecake Squares will sure to be a favorite dessert for everyone! Preheat oven to 350° F. Grease a 9x13-inch pan. Place flour, sugar and salt in food processor and pulse. Add butter and process until the dough begins to form a ball, adding ice water if necessary. Press dough evenly over the bottom of the prepared pan. Bake until crust is lightly golden, about 20 minutes. Let cool for 30 minutes. While cooling, prepare filling. Mix softened cream cheese, sugar and vanilla until well blended. Add eggs and mix just until eggs are incorporated. After crust cools for 30 minutes, pour cheesecake filling evenly over the crust. Spoon blueberry jam randomly on top of filling and then swirl to combine. Bake for approximately 35-45 minutes or until center is set. Allow to cool in pan. 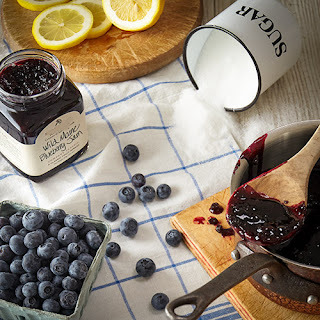 Just sweet, intensely flavorful wild Maine blueberries, the right amount of sugar and a splash of lemon is what we use in our crafted, top selling Wild Maine Blueberry Jam. Bursting with tiny, hand-raked Maine blueberries to enhance your favorite morning bread. Perfect to spread on pancakes, enjoy an extra special pb&j, or surprise someone with breakfast in bed!